High risk and/or complex confined spaces? Does your organisation have enough experience and depth of knowledge to deal with confined spaces? Ensuring your confined space entries are carried out to the safest standard possible? Does your Rescue Plan have enough resource for your own staff and/or the emergency services? Are your risk assessment method statements and safe systems of work adequate? Are you meeting the responsibility placed upon you by your clients? The STAS team of Confined Space Safety and Rescue Specialists have a genuine understanding of the issues faced within these challenging environments and are fully conversant with the requirements of the Confined Space Regulations. 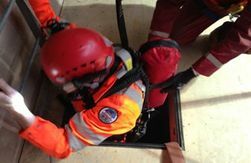 Qualified not only to manage, work and rescue in confined spaces, they can also carry out emergency Trauma care in accordance with HSE/NHS protocols. Our teams are the best in the business. With many years’ combined operational experience, we will work with you to create the safest working environment for your staff. We are also flexible, if you require standby rescue teams or labour to work in confined spaces at short notice we will supply, days, nights or weekends. Fully comply with applicable regulations and local policy. If you feel that we could be of assistance to you please contact us.